Beauty chicks with lashes in need of help, listen up! Dior may have really knocked it out of the park with this set. Whether you've been blessed with lashes that are darn-near perfect or are longing to make them long and lush, the Dior Black Lash Kit is here to bring you the lashes of your dreams. So whether you want to enhance the babies you've been given or want to totally start from scratch, this kit has what you'll need to take your lashes from drab to fab in mere moments. 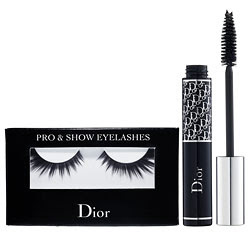 With a set of Pro & Show Eyelashes and a full-sized tube of Diorshow Mascara in Black -- which this beauty chick recently raved about -- this kit definitely has what it takes to make your lashes look absolutely amazing. First of all, take a look at those falsies. Have you ever seen lashes so thick and plush? They're so perfect for your next big night out on the town. And with a tube of Diorshow Mascara by your side, your real lashes will never be the same. It coats them without clumping or streaking and leaves them looking miles long. Unfortunately, this kit is no longer available. Hi Jamie -Thanks for stopping by my blog and leaving comments! I appreciate it - hope you'll stop by again soon. Laura, I hope you enjoy this set! Isn't DiorShow the best? Love your blog, will definitely be visiting it again!